Although many in Wisconsin are feeling optimistic, Claudette Joe is anxious about a Trump presidency. MENOMONEE FALLS, Wis. — It’s impolite, obnoxious even, to toot your own horn. But please indulge me for a moment. I’ve just accomplished something that Hillary Clinton failed to do. I’ve come to Wisconsin. It was easy to get here. There are no border guards. Drive up the frigid interstate, past Milwaukee for a few miles, and you’ll find yourself in this little town, whose motto Clinton — the first major-party nominee to skip this state since 1972 — would have simply loved. “More than a village,’’ it says. A river runs through it. There’s a big Harley-Davidson plant in town. And if you have any doubt that this is the heart of Trump country, take a walk through downtown and meet the faithful who think — know — that their guy is going to deliver on his promise to make America great again. Cue the confetti. Walker is a 71-year-old retiree, who worked as an assistant editor for a manufacturing association’s directory in Milwaukee. She’s got four daughters, 16 grandkids, and an unbridled optimism about the incoming 45th president. Optimism. It’s everywhere here. At the small gift boutique that Kari Ehrler has run for four years after working as a full-time hair stylist, discouraging words are, well, discouraged. Trump’s upset victory in Wisconsin gave him 10 electoral votes and marked the first time a Republican presidential candidate had succeeded in the state since Ronald Reagan’s historic landslide in 1984. Still, Trump won Wisconsin only by a whisker. And along with all that applause you hear along Main Street here, it’s not difficult to find people like me, who are anxious — to put it mildly — about the prospects of an intemperate billionaire businessman behind the world’s most powerful desk. Claudette Joe is one of them. Like her mother, she works as a custodian. Marquette University pays her $15 an hour for her 4-to-11:30-a.m. shift, a job she took after her 25-year career assembling lawn mower engines at a nearby Briggs & Stratton factory evaporated. 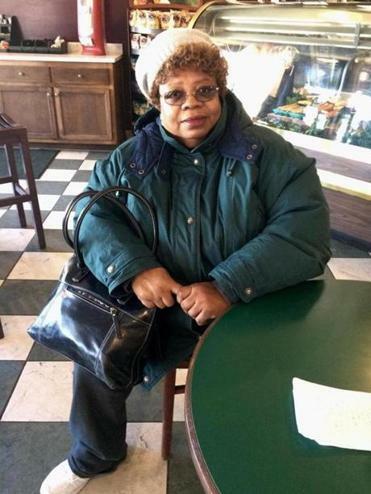 She is 63, a soft-spoken woman who is diabetic and needs insulin and blood pressure medication. And, like a lot of people I’ve spoken to on my road trip through Trump country, she’s concerned that her health care is going to be the first casualty of the new administration. It’s a big country out there. A big divided country. I’ve spent a week talking with coal miners and auto workers, a classically trained musician and an aspiring actor who is certain he’ll hit the big-time. I sat on a bar stool in Milwaukee next to an enormous and friendly old guy who told me he used to be an enforcer for the local mob. I didn’t doubt him one bit. I’ve seen the world’s oldest Harley-Davidson motorcycle in Milwaukee. In Cleveland, I’ve marveled at Johnny Cash’s guitar and the Cub Scout uniform once worn by Jim Morrison of The Doors. My trusty wingman saved us from the inanity of morning-zoo FM radio by introducing me to Marc Maron’s WTF podcast, including a 2015 episode with President Obama. It made me wistful to hear our president — this smart, confident, former constitutional law professor — talk about the essential decency of the good and genuine people who populate this land, themes that formed the foundation of his classy valedictory in Chicago this week. I know he’s right. I’ve seen a lot of them through this 1,350-mile journey. It’s time to get back to Boston and my blue-state home. But before I do, I have the enormous good fortune of wandering into Annie’s Fountain City Cafe in downtown Fond du Lac on the southern edge of Lake Winnebago. Annie and Gary Culver this week marked their first year in business at the site of the venerable old McKnight’s drugstore and soda fountain, where they served me a perfectly crafted hot chocolate. The local newspaper has called this place Fond du Lac’s downtown living room. What a dead-on description. It’s a cheery meeting place of friends and neighbors, a place that makes you want to linger and chat leisurely over the counter as customers nurse cups of coffee. They have a catch phrase around here: “Stubbornly Optimistic.’’ It’s been spray-painted onto the sidewalk outside. It’s stenciled on the sides of the cafe’s ceramic mugs. 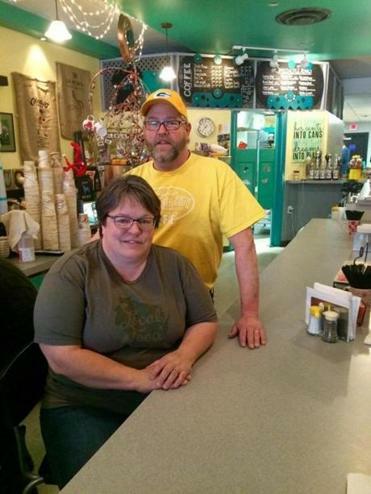 “I love the small-town feel of Fond du Lac,’’ the 46-year-old Annie told me. They’re the kind of people who dress up as Mr. and Mrs. Claus for the downtown Christmas celebration. They’ve got a cool, eclectic spoon collection arrayed on a back wall. Old cranberry grates have been repurposed into shelves. Metal letters spell out Love, Dream, Peace, Joy, Hope. Annie and Gary know what it’s like to undertake a new, big venture. A year ago, few gave them a chance. But they did it, opening their doors to book signings and Bible-study groups, birthday parties and class reunions. They’re working hard, making it all work. Now, they said, it’s time to give Trump a chance, too. Annie’s no Trump supporter, but she’s tired of all the “crabbing’’ that goes on in the dysfunctional echo chamber of Washington. Everywhere I have gone, people tell me it’s that dysfunction that was the critical and powerful fuel that propelled Trump to the White House. How can you argue with that? How can you root for any president to crash and burn? The Culvers insist their positive outlook is contagious. And as we drive away, I pray to be infected. But when I search my forehead for signs of a fever, it’s still as stubbornly cool as the brisk afternoon air.